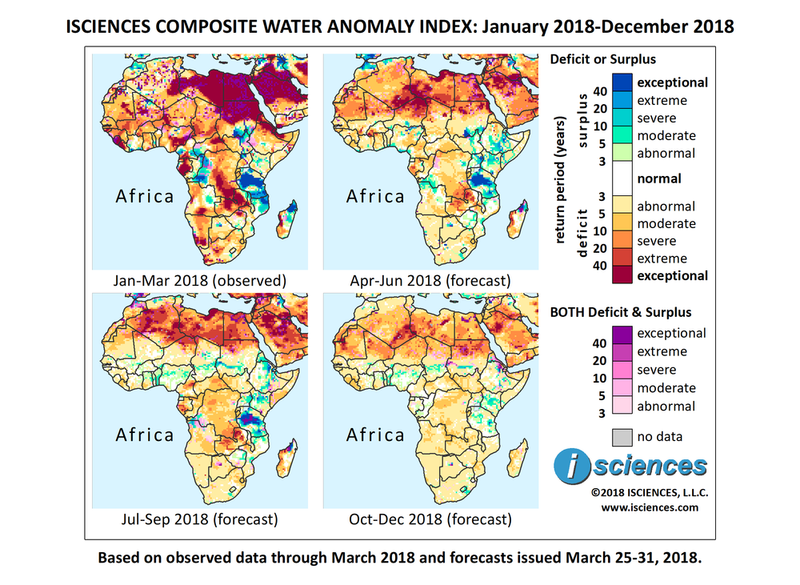 The 12-month forecast (below) indicates exceptional water deficit from southeast Algeria and northern Niger, across Libya, Egypt, and northern Sudan. Farther south, deficits of equal intensity are expected in Gabon, a pocket in southeastern Democratic Republic of the Congo (DRC) trailing into northern Zambia, and west-central Madagascar. Deficits of varying severity are forecast for northwest and central Africa, with primarily mild deficits in the south. Exceptional surplus conditions are forecast for much of central Tanzania. Moderate to exceptional surplus is forecast for the southern part of the country into northern Mozambique and across the Mozambique Channel into northern Madagascar. Surpluses are also forecast for: northern Morocco, a narrow band across the eastern Sahel, Eritrea, eastern Ethiopia, northern Kenya, westernmost DRC, and along the Nile through Sudan, South Sudan, and Uganda. Conditions are expected to be extreme along the White Nile in South Sudan and the Albert Nile in Uganda, reaching exceptional intensity along the Victoria Nile. The forecast through June indicates that, while intense deficits will persist, exceptional deficits will downgrade in Libya, Egypt, and northern Sudan. Moderate to severe deficits will continue to emerge in northwest Africa, and will be especially intense in a large area at the intersection of Algeria, Libya, and Niger. Deficits will diminish in central and southern Africa but severe to extreme conditions will persist in Gabon, southeastern DRC, Zambia, and west-central Madagascar. Prior deficits across southern Africa will downgrade to mild. The extent of surplus will shrink slightly in Tanzania but exceptional conditions will persist in the center of the country, and severe conditions in the south. Prior surpluses in northern Mozambique will retreat. Elsewhere in East Africa, surpluses will persist in southernmost Sudan, downgrade along the White Nile, increase in Kenya, and emerge in eastern Uganda, Ethiopia, and along the Jubba and Shabelle Rivers through southern Somalia. Some moderate surpluses will persist in westernmost DRC and will emerge nearby in northwestern Angola. After June, intense deficits will continue across northern Africa from Algeria through Egypt, and will remain exceptional along Libya’s northeast coast including Benghazi. Primarily moderate deficits are forecast for central Africa. Some intense deficits will remain in southwest Gabon and Zambia, and will emerge in northeast Cameroon. Aforementioned surpluses in East Africa are expected to persist, retreating in Ethiopia and Somalia. A band of moderate surplus will emerge from northern Ghana through Togo, Benin, northern Nigeria, southern Chad, and southern Sudan. The forecast for the final quarter – October through December 2018 – indicates a pattern of water conditions similar to those forecast for the preceding three months, with a slight downgrade in intensity. Morocco’s water supply situation has deteriorated over the past three years. The country’s second largest reservoir, the Al Massira Dam, has experienced a steady decline in volume rivaling the 2005-2008 drought that affected 700,000 people and caused grain production to shrink by 50 percent. The government recently extended its national water plan through 2050. The plan is expected to cost at least 220 billion dirhams (US $23.8 billion) to ensure supply through 2030. Severe weather has continued to impact parts of East Africa, wreaking havoc across Kenya, Tanzania, and Malawi. Flooding continues in Kenya where over 33,000 people have been displaced and more than 20 have lost their lives since early April. As recently as February drought threatened to take Kenya's 40MW Masinga hydropower plant offline, but officials are now warning that Masinga Dam as well as Kamburu Dam are close to overflowing from heavy rainfall. At least 15 flood-related deaths have been reported throughout Tanzania, and 250 homes were destroyed in Dar es Salaam, Arusha, Manyara, and Tabora. Prime Minister Majaliwa expressed assurances that damaged infrastructure would be rebuilt and support provided to those who lost private property. The northern and central regions of Malawi were also hard hit, with the consequences still being assessed. Malawi Vice President Chilima visited the Nkhotakota region where as many as 6,500 people were left destitute, and promised the construction of emergency evacuation centers. The flooding has also exacerbated an ongoing cholera outbreak in Lilongwe, the capital, where the death toll has risen to 30. In early April the UNISDR, in partnership with the Malawi government and with funding from the EU, announced the development of a disaster damage and loss database to enhance monitoring and tracking of disaster damage and facilitate resilience building. While Cape Town’s “Day Zero” crisis appears to have been pushed off to next year, the South African province of Gauteng suffered a severe storm that brought more than a month’s worth of rain in a single day. Local rivers overflowed and roads were damaged or closed. After a decline in recent years, forced marriage of girls has returned along with drought in Somalia and Ethiopia. A recent evaluation found an increase in young Somalian girls being pulled from school and forcibly married as families struggle to provide food. A similar concern was expressed for Ethiopia earlier this year where girls are considered most at risk during extended periods of food insecurity. Agricultural reclamation of desert lands, a long-time goal of Egypt's government, will receive a technological boost from a newly launched sustainable water management program. The program will bring GIS and remote sensing as well as water accounting and monitoring systems to ensure sustainable use of groundwater and irrigation at the aquifer and farm level.